What are your hours of operation? Our business hours are weekdays from 9:00 a.m. – 4:30 p.m. Our Thrift Shop is open from 10:00 a.m. – 3:00 p.m., Monday-Thursdays; 10:00 a.m. – 2:00 p.m. on Fridays and 10:00 a.m. – 1:00 p.m. on Saturdays. Is Abby’s House handicap accessible? At this time, the Abby’s House buildings have limited accessibility. Our offices, program space, and housing at 52 High Street will be fully accessible by July 2019. How do I get to Abby’s House? For directions to our main facility at 52 High Street, click here. Where can I park? For visitors, volunteers, and donors coming to 52 High Street, there is a small parking lot behind the building. There is also on-street parking in the area and a parking garage across the street. Due to the limited number of parking spaces, we ask that visitors to our Thrift Shop utilize on-street or garage parking. Where does your funding come from? Funding for Abby’s House comes from community, civic, and religious groups and individuals like you. We also raise funds from events, mailings, rent, Thrift Shop revenue, and corporate and private foundation grants. What services do you offer? 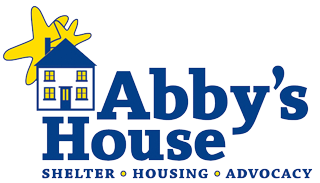 Abby’s House provides shelter, housing, and advocacy services to women with or without children. How do I apply for shelter or housing? To apply for shelter or housing and to learn more about our programs, please visit our shelter and housing pages. Are you always full? We are usually full, but beds and units may become available at any time, so please visit our shelter and housing pages or contact us at 508-756-5486 for the latest updates. Do people have to pay to stay at Abby’s House? Guests in our overnight shelter do not pay any fees. Residents in our affordable housing pay a monthly rental fee. Vouchers are accepted and rental assistance may be available according to income. How long can people live at Abby’s House? Guests in our overnight shelter can stay up to 90 days. There is no time limit on how long residents can live in our service-enriched affordable housing units. What is Abby’s House policy on drugs and alcohol? Abby’s House shelter and housing are drug and alcohol free. No smoking is allowed in any building, but there are designated outdoor smoking areas. Abby’s House applauds women in recovery, and advocacy staff connect women to supportive services to help them to maintain their recovery. Can residents and guests have pets? For health and safety reasons, residents and guests are not permitted to have pets. However, Abby’s House has partnered with a pet therapy program, which has volunteers make weekly visits with their trained therapy dogs. Where do shelter guests go during the day? Shelter guests are out and about during the day. Some are trying to secure long-term housing or social service program placement, others are taking part in day programs, and others are working. Some stay with friends or relatives during the day, or come to 52 High Street to use the Women’s Center or to meet with their advocate. How do I make a monetary donation? You can make a donation online or mail a check to Abby’s House, ATTN Becky Schoville, 52 High Street, Worcester, MA 01609. Yes, you can make a donation online or mail in a donation in honor or in memory of someone. Please note who you are honoring or remembering and provide an address for which we can send the acknowledgement to. When and where can I drop off needs list items? Donations of needs list items are accepted at 52 High Street in Worcester, MA weekdays from 9:00 a.m. – 4:30 p.m. Please contact our In-Kind Donation Coordinator, Jean Anger, at 508-756-5486 x227 or gro.e1556136534suohs1556136534ybba@1556136534naej1556136534 prior to organizing a donation drive. I would like to donate clothing to women in need. How do I go about doing that? Donations of new and gently used women’s clothing, shoes, jewelry, and accessories are accepted in our Thrift Shop. Women in need, including those who are staying or living at Abby’s, are able to access vouchers for free clothing from the Thrift Shop. When and where can I drop off items for the thrift shop? Items for the Thrift Shop are only accepted at the Thrift Shop during hours that it is open: Monday through Thursday: 10:00 a.m. – 3:00 p.m., Fridays: 10:00 a.m. – 2:00 p.m., and Saturdays: 10:00 a.m. – 1:00 p.m.
Can I host an event to benefit Abby’s House or raise funds for Abby’s? Yes! First, please fill out our community and group fundraising form so that we can learn more about your plans and how we can support you in raising money for Abby’s House. Is there an age requirement to volunteer? Yes, you must be at least 18 years of age or older to volunteer. If you are younger than 18, you can still make a difference. Contact our Volunteer Coordinator, Jean Anger, at gro.e1556136534suohs1556136534ybba@1556136534naej1556136534 or 508-756-5486 x227 about doing a donation drive or cooking a meal to bring in for our guests and residents. Are there volunteer opportunities for individuals and groups? Yes, there are volunteer opportunities available for individuals and small groups. Please visit our volunteer page to learn more about the available opportunities. Start the process of becoming a volunteer by filling out a volunteer application. Yes, we do offer internships, and opportunities are extremely limited. Please visit our volunteer page to check if there are any available opportunities. When is the Thrift Shop Open? The shop is open Monday through Thursday: 10:00 a.m. – 3:00 p.m., Fridays: 10:00 a.m. – 2:00 p.m., and Saturdays: 10:00 a.m. – 1:00 p.m. The Thrift Shop is closed on all federal holidays. What kind of items can I donate to the Thrift Shop? Donations of new and gently used women’s clothing, shoes, jewelry, and accessories; new and gently used household goods; and new, unopened health and beauty products are accepted in the Thrift Shop during our hours of business. We do not accept donations of books, computers, TVs, furniture, records, record players, hangers, used pillows, men’s clothing or used children’s clothing and toys. Please note that we can only accept children’s clothing or toys if they are new, in package or tagged. Is the Thrift Shop open if it snows? The Thrift Shop will be closed if the Worcester Public Schools are closed. We will also post a cancellation notice on our website and Facebook page. Where does money from the Thrift Shop go? Proceeds from the Thrift Shop help support our shelter, housing, and advocacy programs. Contact us at gro.e1556136534suohs1556136534ybba@1556136534ofni1556136534 or 508-756-5486.